Last year, in honor of Earth Day, Cowper Campus faculty came up with the idea of having a “photocopy-free day” on campus. The experience was so rewarding, that this year, not only are we repeating the experience, but we are now making each week following a vacation - a photocopy-free week. What do we mean by photocopy-free? Basically, we refrain from photocopying worksheets and other items (as much as we can). The result? The entire school community seems a lot more relaxed, we teach our students about environmental values, there’s a wellspring of ideas shared between adults as to activities and such that can be done without photocopying, and there’s also a well-deserved rest for our hardworking photocopy machine! Our students continue to do their different daily activities (math, painting, writing, science projects, etc. 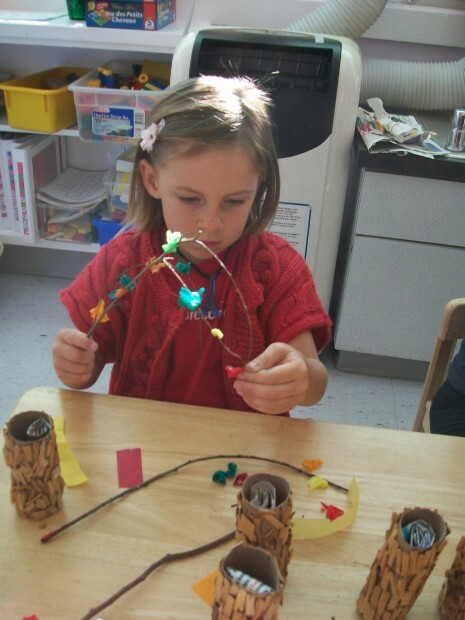 ), but they use different supports and work mainly with a lot of manipulations or hands-on activities. The use of paper is kept to the bare minimum, and during these weeks, we all have an epiphany: how did we get so dependent on using paper?? Children (and us adults, too!) can be creative if we so choose. Our dependency on paper isn’t absolute. As an example, our students reuse magazine pages or empty cartons and boxes – we recycle and reuse what already exists. Not only are we being kind to the planet, but we are also expanding our own understanding and creativity – challenging norms and realizing that perhaps what we think is necessary – really isn’t. Personally, I believe that the use of worksheets during the early years is not only unnecessary, but it can also hinder the learning process. Worksheets may be reassuring for us as parents and teachers, as proof that children have been working and not just “playing.” But the actuality is that there are many other ways to document learning that takes place in early years. It’s important to realize that learning takes many forms; it can happen in play-based situations and hands-on activities. Through developmentally-appropriate hands-on activities, students learn skills and build the foundation they need for future learning. We can document student work and progress by keeping portfolios, which includes work samples, records of skill development, photographs, multimedia, and newsletters which explain the activities and their objectives. In closing, I’d love to share this article with you from Early Childhood News titled, "The Worksheet Dilemma: Benefits of Play-Based Curricula."